A recent report published by Infinium Global Research on Marine Market cables and connectors market provides in depth analysis of segments and sub-segments in global as well as regional markets of marine cables and connectors market. The study also highlights the impact of drivers, restraints and macro indicators on the global and regional markets of marine cables and connectors over the short term as well as long term. The report is a comprehensive presentation of trends, forecast and dollar values of global marine cables and connectors market. According to report the global marine cables and connectors market is projected to grow at a CAGR of 5.9% over the forecast period of 2018 - 2024. Fiber optic cables are being widely used as they provide efficient data transfer and have high speed data transfer capabilities. The rising global demand for higher bandwidth for effective and faster transmission of data and huge investments from the defense and military sectors are expected to drive the market in the near future. However, the market for marine cables could be affected by fears from activities such as shipping and fishing and the need for high capital investments are the factors restraining the growth of the market. Moreover, increased focus on improving telecommunication infrastructure across several emerging economies due to saturation of internet of things is providing several growth opportunities for the key players in the marine cables and connectors market in the years to come. The report on global marine cables and connectors market covers segments such as type, underwater depth and end-use. The type segments include cable and connector. On the basis of underwater depth the global marine cables and connectors market is categorized into beach joint 1, beach joint 2, burial and free lay. Furthermore, on the basis of end-use the marine cables and connectors market is segmented as military, defense, oil & gas, power transmission, telecommunication and others. The report provides profiles of the companies in the global marine cables and connectors market such as, Fujitsu Limited, Molex, Scorpion Oceanics, TE Connectivity, Inc, eledyne Marine, HESFIBEL, Huawei Marine, SAMCO Inc, Eaton Corporation Plc, SEACON, and Hengtong Optic-Electric Co., Ltd. The report provides deep insights on demand forecasts, market trends and micro and macro indicators. In addition, this report provides insights on the factors that are driving and restraining the global marine cables and connectors market. Moreover, IGR-Growth Matrix analysis given in the report brings an insight on the investment areas that existing or new market players can consider. The report provides insights into the market using analytical tools such as Porter’s five forces analysis and DRO analysis of marine cables and connectors market. Moreover, the study highlights current market trends and provides forecast from 2018 to 2024. 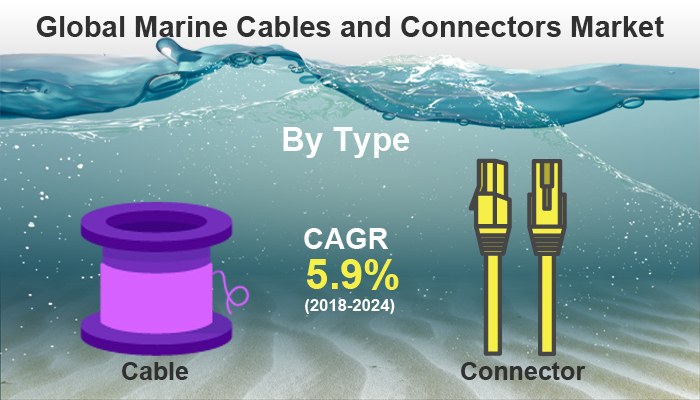 We also have highlighted future trends in the marine cables and connectors market that will impact the demand during the forecast period. Moreover, the competitive analysis given in each regional market brings an insight on the market share of the leading players. Additionally, the analysis highlights rise and fall in the market shares of the key players in the market. This report will help manufacturers, suppliers and distributors of the marine cables and connectors market to understand the present and future trends in this market and formulate their strategies accordingly.